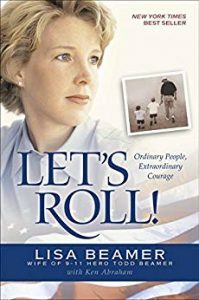 Let’s Roll: Ordinary People, Extraordinary Courage by Lisa Beamer is a highly moving and inspiring book, with the right balance of harrowing details and faith elements to ground this true story in hope. For those unfamiliar with this story, Lisa is the wife of Todd Beamer, one of the many unsung heroes who perished on United Airlines Flight 93 a few minutes after ten a.m. on September 11, 2001, in Shanksville, Pennsylvania. Evidence from phone calls before the plane went down reveals that Todd and other passengers on board determined to take back the plane from the terrorists; unfortunately, their efforts ultimately led to their deaths, yet their sacrifice undoubtedly spared many more lives than those lost on the plane. This is the story of what happened that day, particularly Todd’s role. Let’s Roll is in some ways Lisa and Todd’s life story, in another a gripping, detailed account of how heroic deeds kept a commercial airplane from crashing into the White House and possibly killing the president of the United States. I’m unsure whether most people realize what could have occurred that day if those on board the plane hadn’t done the right but hard thing. They wanted to live; they had no idea that none of them would be going home. Getting to know Todd and Lisa better both moved and unsettled me. Understanding the details of that terrible are disturbing enough, but knowing the actual victims of terror up close makes the story even more harrowing, if that’s possible. I was surprised by a few details, which made the story even more memorable. Todd was born in Flint, Michigan, in 1968. I was born one year later in the same city. That could have been me on the plane. 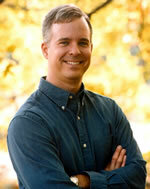 Though Todd and I pursued different paths, we had much in common due to our shared faith. Lisa does a great job sharing the gospel and showing how a true relationship with God works in the face of real tragedy. She doesn’t paint herself as some perfect saint but a flawed person who had her faith to cling to during trying times. Some have apparently criticized Lisa for writing this book, as if she intended to profit from her husband’s death. Judging motives is always tricky motives, and no one but Lisa can answer that claim. I found her story to be both authentic and inspiring. And if she profited from the book, why not? Todd left her as a widow with two kids and one in her womb. If the book helped her support her family without a husband, more power to her. I learned a few things I didn’t know before. Those who explored the crash site found a list of instructions for the terrorists to follow before their last deed as martyrs–everything from shaving the body of as much hair as possible to clenching the teeth at the moment of impact. In the meantime they were instructed to meditate on several religious texts intended to remind them of their dedication to Allah and perhaps calm their nerves. What a tragedy to consider what they gave up in the name of a false religion. I always wondered about the grisly details of recovering remains after a plane crash of this magnitude; keep in mind that the plan went straight down into the ground, so no one could have possibly survived. Investigators of the crash site were able to identify the remains of all 37 victims and gave each family something to bring closure. I didn’t realize how many victims of the flight made phone calls from the plane before it went down. Their conversations, as family members remember them, are haunting and memorable. (What would you say to a spouse if you knew you were about to die?) Not wanting to upset Lisa, who was expecting their third child, Todd chose not to call Lisa directly. Instead he called a GTE supervisor, Lisa Jefferson, who asked him questions about the hijacking, gave him encouraging words, and even recited the Lord’s Prayer with him before he described plans to take the plane back from the terrorists. His final words were to other passengers, and the United Airlines rep overheard him. “Are you guys ready? Let’s roll.” Along with Todd were some who had aviation experience and possibly could have landed the plane had their efforts been successful. Todd left the call open, and rep stayed on the line (overhearing shouts and screams) until the plane’s crash, when the line went dead. Imagining what Todd must have experienced during his final moments is sobering. At times I felt that Lisa spent too many words on rather mundane details about growing up and meeting Todd when I was more interested in Todd’s experience on the plane on the morning of the terrorist attack. I understand why Lisa wrote the book as she did, and no one can blame her for that. In many ways she recorded her last memories of her husband, and her children, as they grow older, will have something meaningful to remember him by. This is a recommended read that tells the truth about unexpected death and doesn’t shy away from a strong faith message. Keep some Kleenex nearby and consider donating to the foundation created in Todd’s memory to help surviving children of 9-11 victims. Either way this is a worthwhile and sobering read you won’t quickly forget. Thank you, Adam, for bring this to my attention. I’m putting it on my TBR list.